Hello friends! Thanks for joining me. Today I’m back with another project featuring the Eau de Lavande Label Etched Dies by Spellbinders. 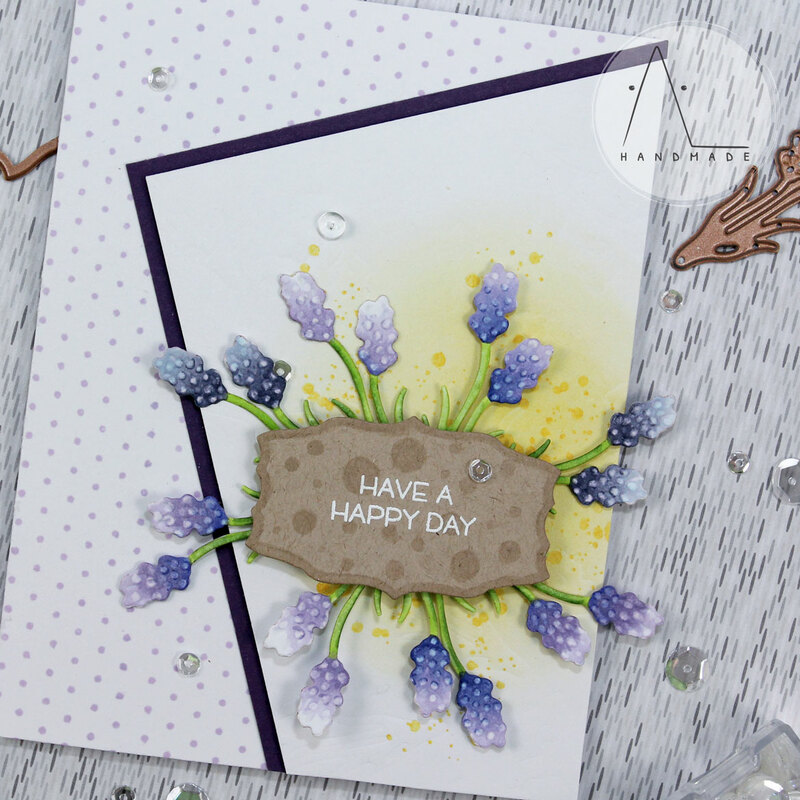 I really enjoyed this set: there are three fancy frames and a beautiful lavender accent – something perfect to enrich your projects with sweet details. Moreover, each shape is so stylish and I love how you can combine them to create awesome compositions. 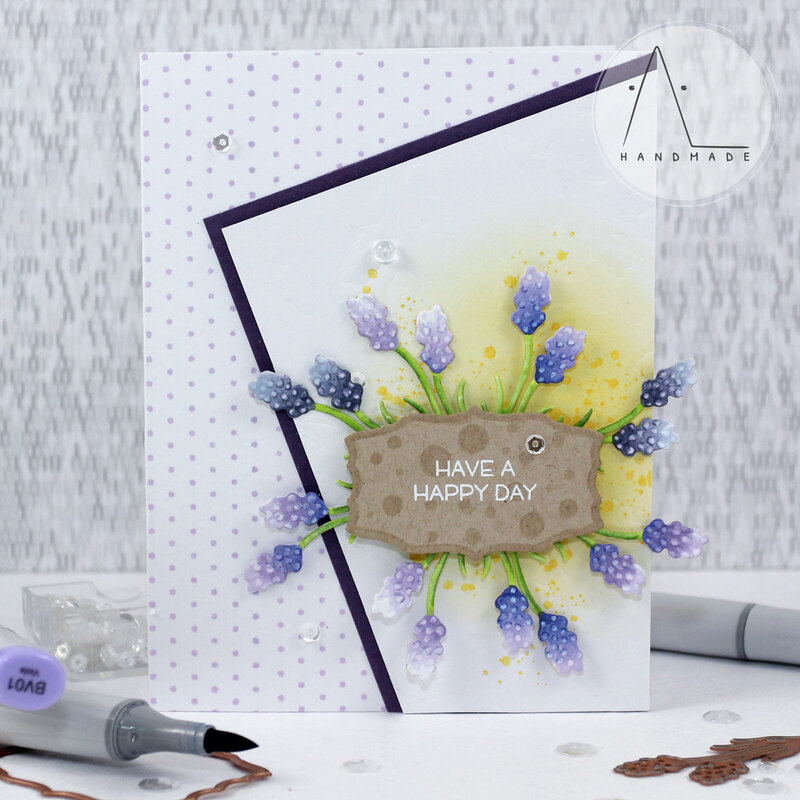 I started to work on this card by die-cutting several lavender accents out of white cardstock and colored them with Copics, adding some texture to the blooms with my colorless blender. Then, I used the same die to emboss some flowers on a withe cardstock panel with the help of an embossing mat. I stamped a dot pattern on a card base with Memento Lulu Lavender dye ink using one of the stamps from the Boutique Borders Set by Mama Elephant. Then, I trimmed down my embossed background and mounted it on my card base, placing a panel of purple cardstock between them. Next, I die-cut a label out of kraft cardstock using the insert die included in the Eau de Lavande Label Set. I made it a little smaller by die-cutting the first half of it and moving the die before cutting the second half. I heat embossed the sentiment in white and embellished the label with my colored lavender accents, popping my die cuts up using foam tape. Finally, I foam mounted the label onto my card base and added some sparkling clear sequins as embellishment.